The Printer's Marketing System. Serious tools for printers who are serious about growing share and profits. 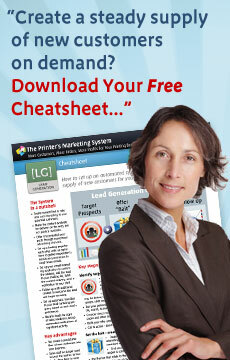 Win new orders and strengthen customer relationships with easy-to-use, ready-to-print direct mail for printers. Simply download your files, drop in your logo and contact details, and they're ready for prepress. Ready To Send Content You don't have to write or design anything – it's all done for you. You have access to our extensive library of mailers, to download and use whenever you want. Easy Customization All mailers contain placeholders for your logo and contact details – files can be ready for prepress in just a few minutes, or customize more fully if you like. Showcase your capabilities Choose from postcards and newsletters, all designed to display your printing capabilities with colorful, eye catching graphic design. Campaigns for different audiences Choose one mailer for all your prospects and customers, or segment your list and use a combination of mailers to reach the right audience with the right messages. Fully editable source files supplied You can make all the mailers your own – and even more effective – by editing images and text in layered psd and eps files, as well as in layout files. Popular file formats Choose from InDesign or Quark files, PC or Mac. If you haven't upgraded recently, don’t worry – files are saved back for legacy versions. I will send the download link to the email address you provide, and follow up with a series of helpful email tips on lead generation and customer acquisition — you can instantly unsubscribe whenever you choose. Is your territory still available?